Line an 8-inch baking dish with parchment paper. Add about half of your cookies to the bottom of the baking dish. Set aside. In a mixing bowl, add the white chocolate chip and marshmallow cream. Set aside. In a large saucepan over medium high heat, combine sugar, butter, cream and salt. Bring to a boil. Stirring constantly, boil for a full 4 minutes (ROLLING BOIL). Remove from heat. Pour hot mixture into the mixing bowl with the marshmallow cream and white chocolate. Beat until smooth (about one minute). 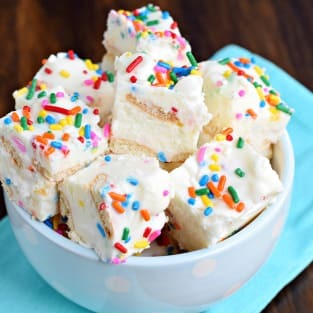 Fold in the remaining cookies, marshmallows and half the sprinkles. Add the remaining sprinkles to the top of the fudge. Refrigerate for 2-3 hours until firm. Before cutting into pieces, allow to come to room temperature.